Notes: "In Singapore, the school canteen consists of several stalls selling different types of food, run by different individuals. It's rather like a mini foodcourt. Students are free to purchase anything they fancy. There are national guidelines in place to ensure that the food is healthful. Some schools go the extra mile - they ban deep-fried food and processed meats. At the Muslim food stall, he bought a plate of fried rice with three sides - crispy fried anchovies, omelette and cabbage stir-fry with tomato and beansprouts - for $2. 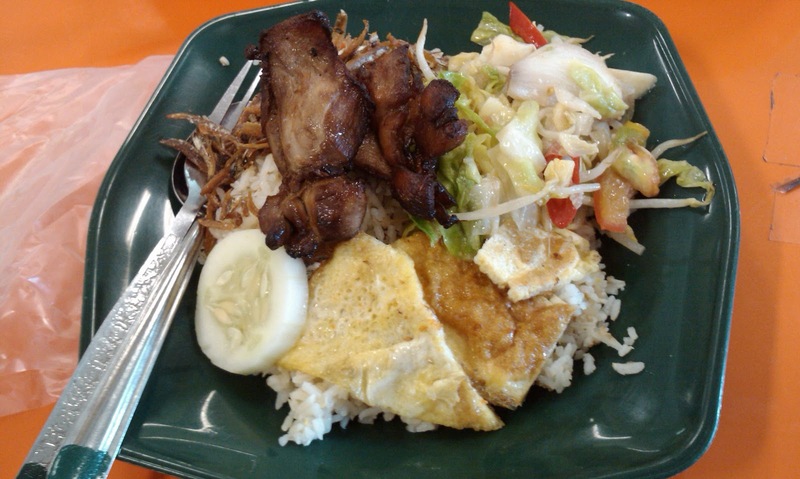 He walked his plate over to the Western food stall, bought Chicken Chop - minus the trimmings - for $1. He notes that the chicken is skinless. Then, he walked over to the Snack stall and bought 2 pieces of Garlic Bread for $1. The Garlic Bread never made it into the picture." I'd have liked something similar growing up. We were stuck with the high school caf that only had hot dogs, hamburgers, or fries. not exactly healthy by any means. Yeah, can you imagine having a little food court with lots of different options? I think if you give kids a healthy, tasty variety, they will respond well to it. Just imagining a US school foodcourt..... it could be awesome, a sushi bar, salad bar, stir fries, sandwiches, fruit and yohgurt! Sadly I think it probably resemble the kids menu at every restaurant here...hamburger, cheese burger, pizza, mac n cheese , chicken tenders....you want fries with that?